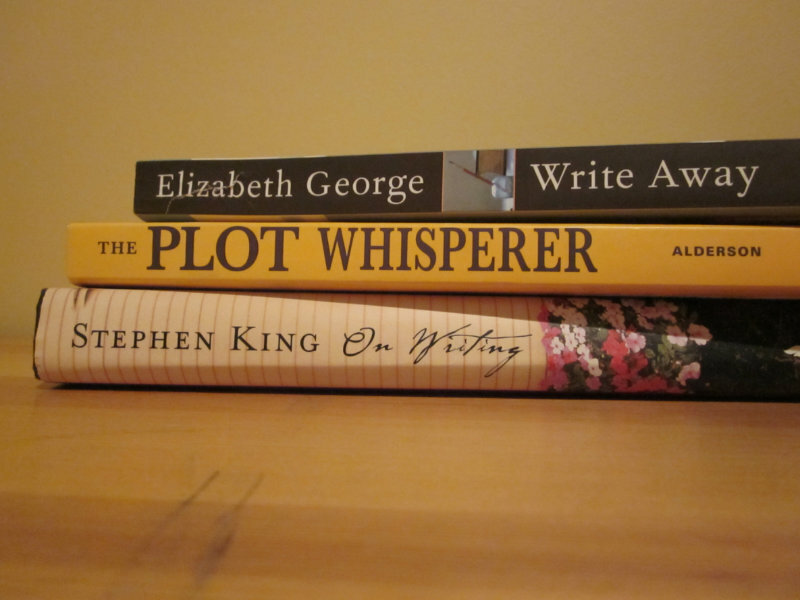 There are many books on the market about the craft of writing, some general, some focused on very specific aspects. The following three made an impact on me when I read them several years ago and bits of their content still come to mind from time to time. I’ve experimented with the processes and techniques described in these books. 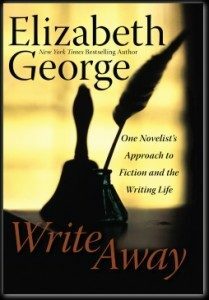 Best-selling mystery writer Elizabeth George’s book about the craft of writing focuses on her own process, and her conviction that character drives the story. Her process begins with a rough idea, followed by development of in-depth character profiles. She then develops a high-level scene outline of the first (or next) dozen scenes, followed by a more detailed running plot outline. A strongly left-brained writer, she writes both the character profiles and the running plot freely, in a stream-of-consciousness manner, to engage the right side of the brain. Like Elizabeth, I am also strongly left-brained. Therefore, many parts of her process resonated with me. I alternate between writing from the seat of my pants and outlining. The running plot described by Elizabeth George works well with that approach. Creating character profiles not only brings more depth to characters, but also, surprisingly, results in plot ideas. If, however, her process is not for you, the book still contains useful information on character and plot development, creating believable dialogue, and the use of setting and description. She uses passages from her own books and books of respected writers to illustrate her points. I had to go through this book slowly, reading small sections at a time, in order to effectively digest the information. 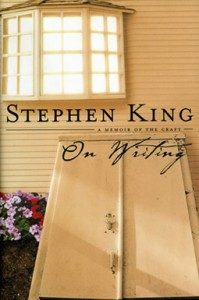 Stephen King’s book is half memoir and half guidance on the craft of writing. The memoir portion speaks to his incredible determination to continue writing and the amazing support of his wife. He includes a chapter towards the end of the book about the accident that occurred during the writing of the book. He was hit by a vehicle while on his daily walk. That chapter is particularly poignant. His approach is quite different than that of Elizabeth George. He is “not a believer in the so-called character study.” He says, “I think in the end, the story should always be boss” and “what happens to the characters as a story progresses depends solely on what I discover about them as I go along – how they grow”. 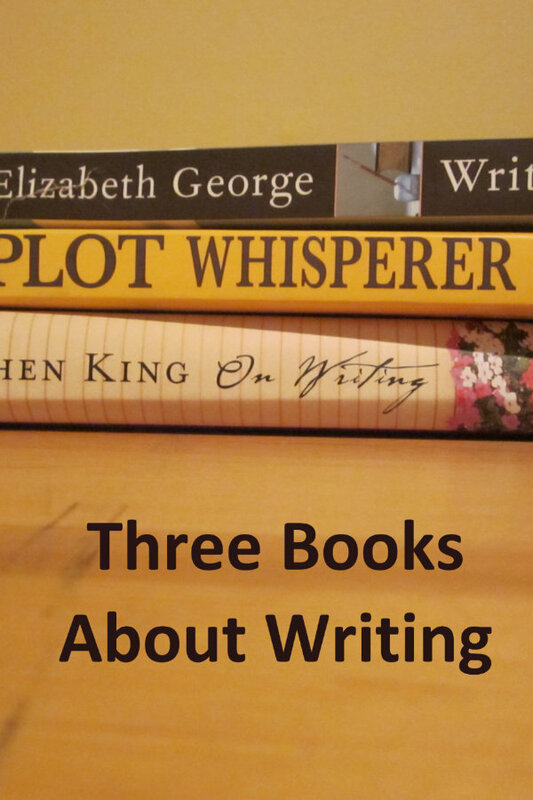 The advice on writing is practical and full of quotable lines. Good fiction always begins with story and progresses to theme. This book is an easy and interesting read, whether you are a writer or not. I thought I detected a note of arrogance in a couple of spots, but it quickly disappeared as I read on. My daughter also read the book. She found no arrogant tone. If I were to sum up Stephen King’s advice on writing in a few words, it would be “less is more”. Martha Alderson’s book provides insight into the construction of plot. It is about structure and form. 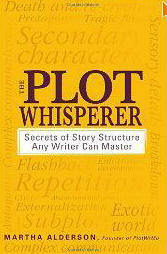 The book dissects the components of a plot and provides tools for the writer to develop her plot and story line. The book does not ignore character. It provides advice for creating living characters with a special focus on mapping a character’s emotional development through the story. A left-brained writer may learn to add more emotional depth to her story by plotting that development. Scene and action plotting may help the right-brained writer structure her story. The approach may seem formulaic, but I think it can (and should) be adapted to one’s own style. Use of the plotting techniques can be made at the planning stage and/or at first or subsequent draft revisions. I found the book repetitious at times. By the last quarter of the book, I found I was skimming and thinking about Elmore Leonard’s line, “I try to leave out the parts that people skip”. I wondered if the author had considered using her plot planner on this book. Still, there is practical information in the book about how to build and shape your story. Plot Whisperer concepts help me think more consciously about the best way to shape or reshape a story. No one book is going make you a writer or tell you everything you need to know. But there are things to be learned by reading with an open mind, trying out techniques to see how they work for you and incorporating those that do into your own personal style and process. An earlier version of this post first appeared on Destinations Detours and Dreams. I’ll definitely check out George’s book. Thanks for bringing it to my attention. Jeri, I hope you find something of use to you in the book.